Jeff helped provide citizen escorts for the blue bus during its weekly journey from Durham down to Thornhill during a time when there was concern over possible regulatory interference with the ongoing delivery of raw milk to cow share members. Scene from the party at the TWS outdoor pizza oven Sept 6th to honour Jeff and Jill Lucas. Jeff also was instrumental, along with others, in helping find loan money for the purchase of an adjoining farm that Michael had been using to grow hay on. Like many others in the cowshare community he has also helped facilitate Michael’s public events and backstage logistics. In fact, we may never know the full extent of Jeff’s involvement in the raw milk effort here in Ontario. When you talk about community gardens to most people they think of a lot of little plots where each person has their own square of ground to cultivate as they see fit. The Carrville Community Garden was never like that. 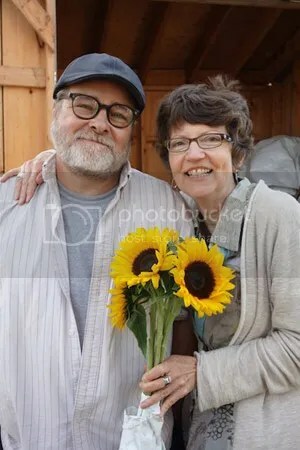 The garden arose from a group of Toronto Waldorf School parents and friends who had been meeting to work towards some form of intentional community. Other members of this group included Doug Wiley, Judith McGill, and Manfred Palmer. 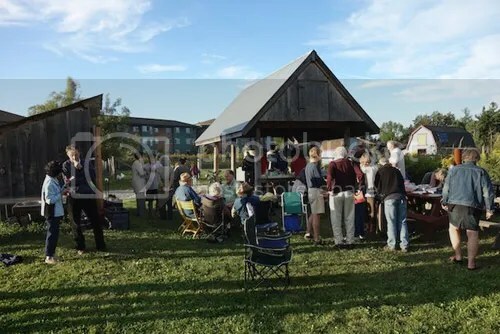 Some members of that group went off to found Whole Village, a by now well established, intentional community in Caledon, led by Dennis Bowman, who was also the architect of TWS. The rest of the group figured that that they would start a community garden on land which the school had purchased some years earlier and was not using for anything yet. That was about 11 years ago. From the start, the CCG members grew their veggies together and divided them up according to the time worked. It was a cumbersome system, but since the prime goal was an exercise in community rather than just a way to get good food, that wasn’t seen as a problem. Biodynamics was always a big part of the vision for the CCG and Jeff was among those who would go to the Guelph Organic Conference each winter to learn more about the method. 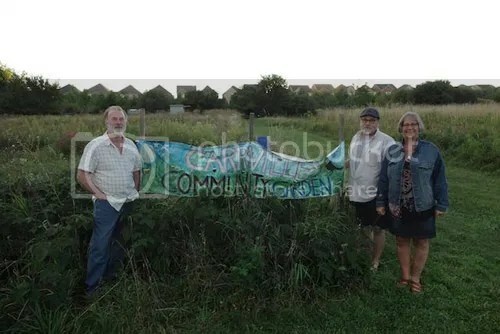 Now, 11 years later, the school has sold the land where the garden has operated, to developers, and although some small scale gardening is still going on there this year with a core group of CCG stalwarts, most of the land is growing weeds. Word is that the topsoil on the recently sold land could be bulldozed in as little as three weeks in preparation for the start of development. Jeff and Jill’s party may well have been the last major social event to be held on this soon to be developed garden space. The good news is that the school will get to keep the removed topsoil. The company that bought the land, Senator Homes, has recently opened a sales office in the TWS Bathurst St. parking lot. In addition to the school land they are also building on what used to be a sheep pasture between the TWS parking lot on the south side, and a shopping plaza on the north. Townhomes there will start at $700,000. As we have reported earlier throughout last year, there had been concerted efforts by various members of the community (i.e. Hexagon Group, Friends of the Toronto Waldorf School) to seek creative alternatives to such a land sale. In the end, the TWS board found these proposals not acceptable and went ahead with the sale. They did however, keep a North East corner of the land, somewhere between 1/2 an acre and one acre, presumably for the use of future school or related enterprises. On August 18th, 2014 a new board slate was proposed, and approved, with seven out of 14 new board members (after the first proposed slate was not approved at the AGM). Many in the community have high hopes for what this may bring in the way of positive changes in the school and its community. Jeff and Jill Lucas won’t be around to watch the unfolding of what many hope will be a new phase in the community’s development. Jeff is retiring this year from his job as a firefighter. He and Jill are moving back to London, Ontario, which is where they are originally from. We wish them well in their new endeavours.